This post by Vilno inspires me to briefly exmaine the protean nature of national identity. I don't wish to comment on his post but rather to use it to make some points about national identify. One is the importance of religion as Vilno rightly points out the rebellion that crated modern Belgium was on religious lines-religious not ethnic. The fact that Flemish is much closer to Dutch than French as a language was simply not nearly so important. It’s important to realize this is not some unique exception. Ireland can perhaps best be understood as the part of the British Isles that failed to become fundamentally Protestant- it was Catholic inhabitants of Ireland not Gaelic ones who became Irishmen- there would never have been enough support for independence if it the divided had been linguistic. . More secular is German nationalism -not usually thought of as a confessional based nationalism-and rightly so. On the other hand the modern southern boundaries of Germany were essentially deliberately created by Bismarck to make a clear Protestant majority in the new "Reich". Even more remarkably in one referendum on the Germany borders after World War one Protestant Polish speakers voted by over 90% to be in the new Germany rather than the new Poland -so even in Germany nationalism had a religious component. Or rather it might be truer to say that that was the case for Polish nationalism- Polish nationalism had been an elite obsession throughout the nineteenth century (for example this books shows the famous 1848 rebellion led to massacres of nationalist rebels without encouragement from the has burg authority-indeed to their slight horror). This owed a great deal to the indifference even hostility of the church- the leading Polish prelate in "German Poland" (Poland at that time being divided) in the 1870's didn’t' even speak Polish properly! Bismarck’s vicious Kulturkampf ironically partly out of paranoia of Polish nationalism predicated the end of this state of affairs as the cleary and laity identified Polish nationalis with the struggle for their faith- by the early 20th century Polish nationalism was a mighty popular force. To this day Polish Catholicism and Polish natoinalism are almost inextricably linked. Religion can often be mixed up with issues of national identity today elsehwere as well. This is not just rue in pious countreis. The former Yugoslvaia was exceptioaly secular among it's population-but the division between Serb, Croat and Bosnick are essentially religous in nature-even if this difference is one of what church or mosque you don't go to. This can be true even in Finland often identified (probably wrongly but it can't far from it) as the most secular country on earth. Nonetheless One candidate for the Presidency of Finland was however repeatedly interrogated in 2006 on how a Catholic could be president of Finland! Indeed more generally my understanding is that religion is exceeded only by language as a cleavage that determines national identify. 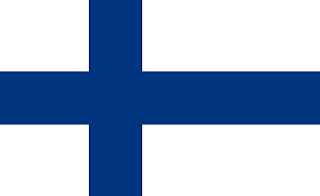 The picture shows the flag of Finland- adopted after World War 1-which as you can see is a religious symbol. I agree that religious identity plays a big role in the development of nationalism. But, I think that, normally, this will often end up being challenged by ethno-linguistic nationalism, especially in a secular form. For example, the fact that Belgian society has become more secular has meant that there is room for a Flemish nationalist movement to grow and develop as people lose their Catholic religious identity and embrace a Flemish nationalist/regional one. As I said I think language is the most important cleavage even more than religion-though of course the two can reinfrce-as happened for a long time in Belgium-and arguablly still happens a bit. I agree secularisation has been a big cause of the rise of Flemish nationalism ( I think i'd put an emphasi on this much more than most commentators) though I hope in other posts to point out some other important reasons. However language is not the only one. Ireland, Belgium (including Flanders- bear in mind the current movement is for independence not irredetism)and Bosnia show that religon can trump language-and in the last case societies don't get much more secular.Siilarly Swiss seculirsation has not led to secessionism the way it has in Belgium. I think History has a lot to do with this. insfoar as Bangladeshi independence was the result of nationalism i agree with you- though it's partly just the protean nature of nationalism, I will leave India because I am muslim , i will leave Pakistan because I am bengali-but ( and you will probaly know more than me) i odn't ger the impression there's ever been any real interest in Bangladesh merging with Hindu Bengal.